« Try not to faint. … *whoooooooooo* There. That should get the dust off this puppy. As it was so subtly pointed out to me by someone on Googlechat last night, it’s been two weeks since my last blog entry. I didn’t plan for it to go that long, but sometimes life has other plans, you know? So, since we last spoke, hubby turned 34 (Yes, he’s two weeks younger than I am. And never lets me forget it. ), my lovely SP figured me out and received her last package, and the hat count for this year has reached (drumroll, please) 227! That’s right – we’re only 23 away from reaching the goal! Thanks to the generosity of Ellen’s Half-Pint Farm and Great Adirondack Yarns, there will be TWO places at Rhinebeck for people to drop off hats. Mary Beth Temple will be signing her book The Secret Language of Knitters from 1-3 at the Ellen’s booth (building 26, booth N) both Saturday and Sunday, and has volunteered to collect hats. If you miss MBT, you can stop by Great Adirondack Yarns (building 22, booths 2 and 3) anytime to drop off hats – I’m bringing them a box for the hats. I can’t thank these ladies enough for helping me out with this project. All pinned out on my blocking board, happily drying so I can wear her at Rhinebeck this weekendÂ (The colors are a bit better in the first picture, because the blocking one is still wet). 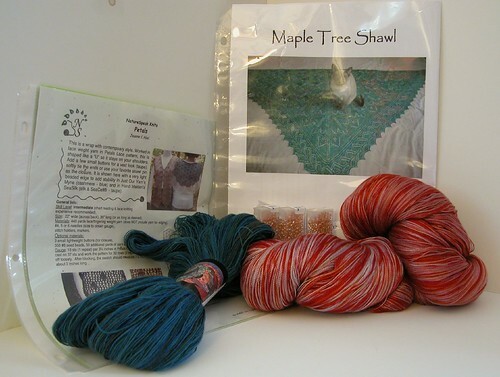 So yes – if you’re a Blogger Bingo-er and I’m on your card, you can look for Charlotte’s Web on Saturday or the Chrysanthemum Tea Shawl on Sunday. My first CW about doubled in size when I blocked it, because I blocked it pretty hard – I needed it to grow. This one I am not blocking nearly as hard. I doubled the number of repeats in the solid sections of the first three colors, and did 1-1/2 times the repeats on the last two (I was concerned I might run out if I doubled all five colors). 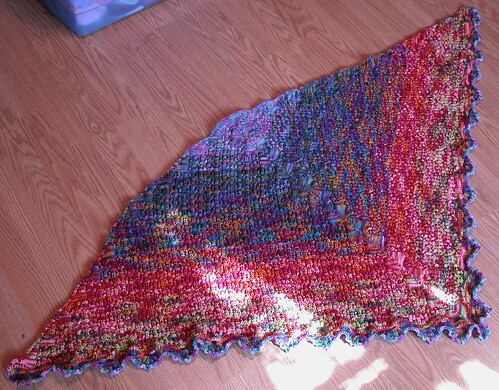 Fresh off the needles, the top edge measured about 66″ across. Pinned out, it’s about 90″ (that picture shows it folded over – it’s too big for the board otherwise). I’m really happy – I wanted it to be big. 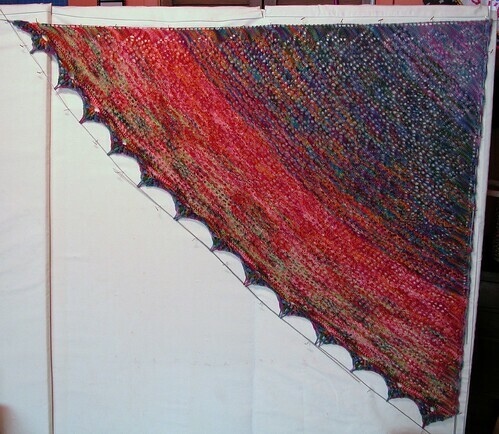 It will be great to wrap up in.I got a lot of work done on the shawl this past weekend because it was Stitches East. My friend Stitchcounter came up from Florida for it again this year, and we had a great time. We both had classes Thursday afternoon and Friday morning and afternoon, and we hit the Market Thursday night for the preview, Friday after class, and Saturday afternoon. Wanna see what I got? 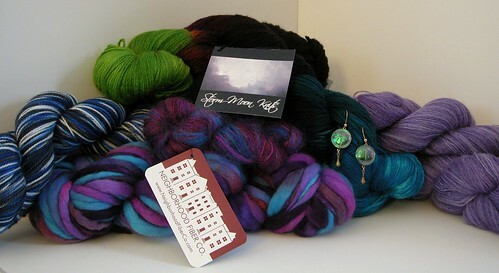 October 16th, 2007 | Tags: Alex, FOs, Friends, Knitting, Planned Projects, Stitches East, Yarn Acquisitions | Category: Misc. Here I thought the 306 stitches I picked up for my CPH button band was a PITA! Ack! I can’t even wrap my head around four digits! Hee, I’ve got more than half of that 23 in my closet…to send or not to send, that is the question! You’ll definately make it over the 250 mark though that’s for sure. I’ll bet you make it to 300 easily! CW looks great!!!! 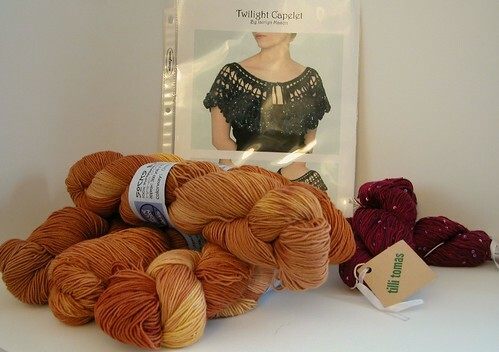 And I’m really loving that twighlight capelet…if only I had a place to wear it and knew how to crochet! LOL! WOW! Your project is BEAUTIFUL!!! It’s about damn time woman. Here I thought you fell off the face of the earth and all. Sheesh. Wait – no fiber for spinning? Wait… there’s a Storm Moon color called “Let There Be Lips”??? I must have it. Anyway, Charlotte’s Web #2 looks fabulous, and I’m glad you finally posted about Stitches! I will miss you at knitting this week. Still have your birthday present! Happy Birthday Pam’s Hubby 🙂 The shawl looks beautiful.